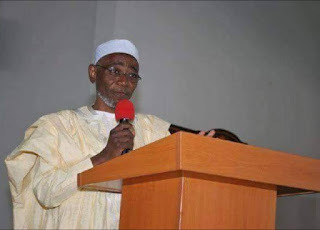 The Minna Book and Art Festival (MinnaBAF) which held last week in Minna, Niger state celebrated the life and writings of late writer Abubakar Gimba who passed away in February 2015. 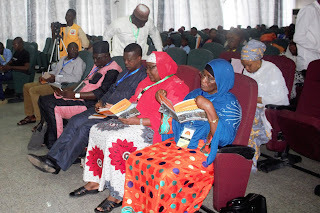 Under a panel named “Remembering Abubakar Gimba”, panellists that included the late writer’s daughter, Hajiya Aisha Abubakar Gimba, discussed critical issues the late author treated in his books such as corruption and promotion of women rights. The uncommon humility and philanthropy of the late author as one of the greatest Nigerian novelists ever to emerge from Northern Nigeria also came under focus as participants recalled his support to people under need and patronage to the arts. According to Abdullahi Ismaila and BM Dzukogi, the late novelist remains the greatest funder and motivator of the Niger state chapter of ANA. They recalled the late writer consistently funding ASCAFS, the flagship project of ANA Niger for over a decade without fail. The Purple Hibiscus Trust announces call for the 11th edition of its creative writing workshop. Applications for the workshop will be open until October 15, 2018. 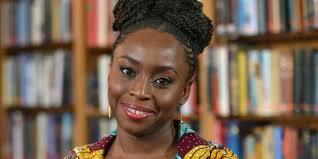 The workshop, which would be run by Chimamanda Ngozi Adichie will start from November 20 to November 30, 2018. HOW TO APPLY Applications will be via email to purplehibiscus2018@gmail.com. The body of the email should contain the following: your name, address, a few sentences about ‘yourself’ and a fiction or non-fiction writing sample between 200-1,000 words. The final shortlisted applicants will be notified on November 7, 2018. Accommodation will be provided for accepted applicants. 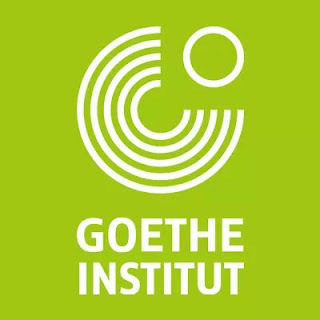 Goethe-Institut Nigeria is organizing a workshop for practicing and aspiring film journalists. Writers with a strong interest in culture, especially film, are encouraged to apply. 8 to 10 participants will be selected for the 5-day Film Journalism Workshop, which will take place daily from November 9 to 13, 2018. Language The working language of the workshop is English. Target Group The workshop is open to practicing and aspiring film critics, journalists, students of film, researchers et c. Applicants with relevant experience in cultural journalism (with particular interest in - but not restricted to – film) will also be considered. Applicants must not be younger than 18 years old. Application door is open for interested applicants for the 2018 Africa Centre Artists In Residency Programme (AIR). The Artists In Residency (AIR) Programme accepts submissions from emerging, mid-career and senior level artists across artistic discipline: visual arts, performing arts, curatorial practice, music, creative writing and literature who are either self-taught or formally trained in their respective discipline. What does an award-winning photograph look like? It can range from a captivating portrait of a family member to a moon-drenched landscape to movement captured at just the right time. The 16th Annual Photo Contest which is now open for submissions, is looking for the best of the best. 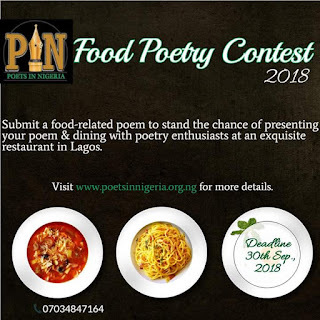 Poets in Nigeria (PIN) is pleased to announce a call for submissions of food-related poems for the 5th edition of the PIN Annual Food Poetry Contest (initiated in 2013 as Eriata Annual Food Poetry Contest). This initiative seeks to explore the relationship between food and poetry within the ambit of literary creativity. 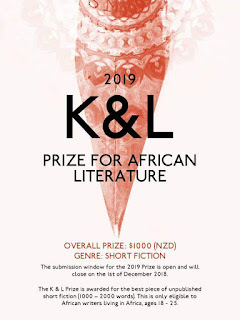 REWARD 20 shortlisted entrants will be invited to a dinner at an exquisite restaurant in Lagos where they will present their poems to the audience and be awarded. Note: This reward can be enjoyed by proxy.